It's not hard to tell if your home has a comfort or efficiency problem. If you have uncomfortably hot or cold rooms, uneven temperatures throughout the house, and high heating and cooling costs, you know upgrades are needed. What you may not be sure about is where to start, which is why Dr. Energy Saver is here to help. Our complete home energy audit is designed to identify problem areas in your home, whether they're in the attic, basement, around windows and doors, or in your ductwork. Once we know what is causing your home comfort problems, we can recommend the right solutions for your needs. If you're interested in having a complete home energy audit conducted on your house, contact your local Dr. Energy Saver dealer today. We can help you make your home more comfortable and efficient all year long! Sometimes energy problems are obvious -- you know if your furnace doesn't work or your attic doesn't have any insulation. However, it can be much more challenging to know how to fix that one room that won't cool down or how to reduce rising heating bills. In these situations, a home energy audit is the best solution. Without the complete energy profile that an energy audit provides, it's difficult to know what upgrades are most important and what the order of improvements should be. For example, an energy audit may tell you that instead of replacing your furnace to lower heating costs, you can achieve more savings with less-costly improvements like sealing ductwork and upgrading attic insulation. Dr. Energy Saver can help you identify the right solutions for your home to ensure that you get a more comfortable, efficient home. 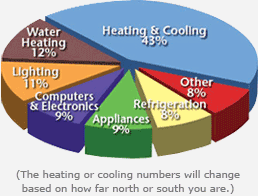 Heating and cooling make up the largest percent of energy usage in a home -- but it's not just the HVAC system that affects this number. Insulation, leaky ductwork, and air leakage are also factors. Home comfort: No one wants to deal with rooms that are too hot in the summer and too cold in the winter or inconsistent temperatures in the house. A home energy audit can identify what's causing these problems so that the right improvements can be made to restore home comfort. Energy savings: Due to the volatile nature of fuel prices, it's important to have a home that runs efficiently. Our home energy audits can tell you where the best opportunities are for you to save money. Improved resale value: Your home's energy performance can have a big impact when it's time to sell. Many home buyers and real estate professionals prioritize energy efficient upgrades and modern systems, so updating your home can provide a great return on the sale price. Green living: Reducing environmental impact is a priority for many homeowners. Dr. Energy Saver can help you find the best ways to reduce your energy use with our home energy audit. If you're ready to do something about the uncomfortable rooms and high heating and cooling costs in your home, Dr. Energy Saver is here to help! Our complete home energy audit will identify the areas of your home that are causing discomfort and energy loss, allowing us to recommend the ideal solutions. Contact your local dealer today to get a complete home energy audit for your home. Our experienced professionals know what it takes to give you a more comfortable, efficient home!